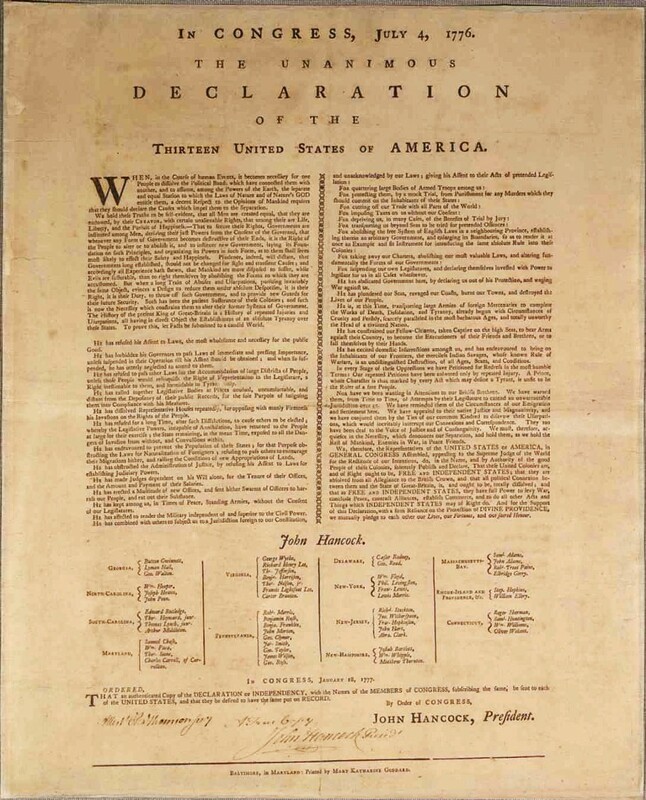 Declaration Broadside went to press October 1, 2009 . In 1777, Congress selected Mary Katharine Goddard of Baltimore to print the Declaration of Independence for each of the thirteen United States. This was the second printed copy, and the first to reveal the identity of the signers. She produced a beautiful 2-column design and added her name at the bottom “Baltimore, in Maryland: Printed by Mary Katharine Goddard” which put her at risk for treason, along with the Founding Fathers. Mary Katharine Goddard offered use of her press despite the dangers she might face. 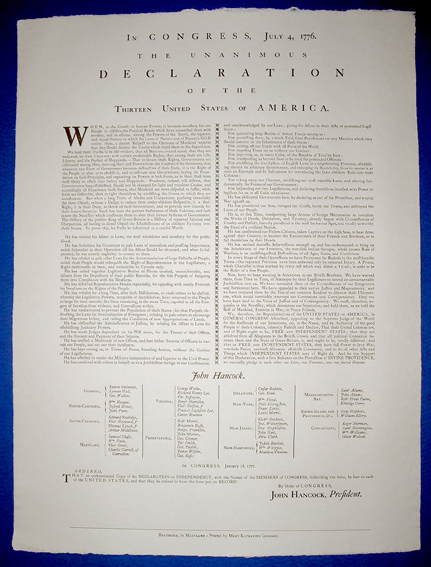 Mindy Belloff has created a hand set letterpress printed broadside, reproducing Mary Katharine Goddard’s elegant design of the Declaration of Independency, published by Intima Press. 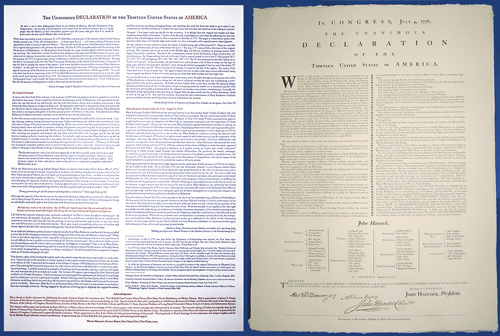 January 24, 2009 – I announced my intention to recreate the Goddard Declaration of Independence, at the American Printing History Association annual meeting held at the New York Public Library. 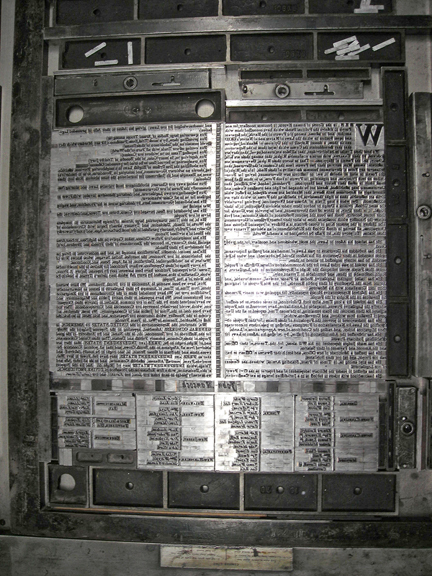 February 2009 – contacted the Maryland Historical Society to get information about their copy of the Goddard Broadside. Tuesday, March 3, 2009 – contacted Rosemary Fry Plakas, American History Specialist at the Library of Congress about viewing the document in Washington D.C. to check the point sizes of the type, impression of printing, and examine the paper (watermark, texture, weight). March 20, 2009 – I spoke with Robert Schoeberlein, Director of Special Collections at the Maryland State Archives in Annapolis. He said their copy had been folded and there was a lot of loss. Having been a Librarian at the Maryland Historical Society, Robert recommended the copy there, which is in very good condition and a better document to view. March 24, 2009 – I met with Jim Green at the Library Company of Philadelphia and began studying the Declaration document. The Broadside is in very good condition, although backed with another sheet. The two edges on the left and right appeared to be cut. The top and bottom were deckle-edged. The point size looked to me closer to 11pt. I was able to take numerous pica measures of the heading, body of the text in two columns, and the listing of the signors in italics on the bottom. It was wonderful to have such access to the document and also to be able to view it on a light table. I talked to Jim about the possibility of my creating an edition that was “gender inclusive” – that all “People” are created equal, as opposed to “all Men.” We spoke a bit about gender roles in colonial times and I knew I had a lot of reading and research to do. April 6, 2009 – Spent many hours at the Library of Congress, examining their copy of the Goddard Broadside, taking numerous measurements. I did not see a watermark on the paper. The broadside is mounted on another sheet of paper, which is also turned over on all four edges (sort of making all the edges double-secure), but it looks to me like the deckle is on all four sides. The measurement listed is 54 x 44 cm. Most of the remaining 9 Goddard Broadsides are not signed. However, the Library of Congress copy is signed by John Hancock and Attested to by Charles Thompson. I received permission to photograph the signatures and am planning to deviate slightly from the hand setting to make a photopolymer plate. This way I can recreate the signatures in a brown/black ink to add more visual interest. Rosemary Fry Plakas was very helpful, having reserved the Goddard Broadside for my viewing before it went onto Exhibitions. She also had other broadsides for me to look at that were printed by Mary K. and a few that were attributed to her brother William. After spending the afternoon with the Broadsides and talking with Rosemary, I decided I should recreate the broadside as it is – an historically correct facsimile. I will do research on colonial women for an essay in the folio. Rosemary suggested I begin with reading Abigail Adams’ letters to her husband. I had also corresponded with Barbara Bair, Historian of 19th c America and Acting Mss Specialist of Early American History, in the Manuscript Division of the Library of Congress. She provided me with a wonderful bibliography about Colonial America. I promptly ordered as many books as I could. I am very interested in finding out how Mary K. became the printer of the Continental Congress, after John Dunlap. However, there is not as much information on Mary K. Goddard as there is on her brother, so the research continues. June 5, 2009 – I visited the Library Company of Philadelphia again, but this time with paper samples in hand that Travis, from Twin Rocker handmade papers, sent me in May. I narrowed down a few choices, but none of the papers were quite right. 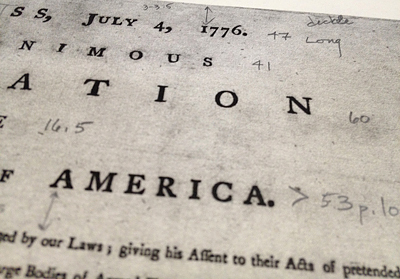 I spoke to Jim about the yellowing of the paper and would like to brighten the color so that it will be closer to what the paper might have looked like in 1777. The text weight is quite thin. Again, I am thinking of going with a slightly heavier weight paper so that it will take impression nicely on my press. June 7, 2009 – At the Hybrid Book Fair in Philadelphia, I spoke with Tom Bannister about my project and he recommended I touch base with Tim Barrett, of the University of Iowa Center for the Book. I promptly contacted Tim upon my return to NY. Tim said he would send some paper samples and also suggested I speak with Katie MacGregor, who worked at Twin Rocker and the Iowa Center. Katie supplies papers to conservators. June 26, 2009 – I received paper samples from Katie and will contact her again next week. 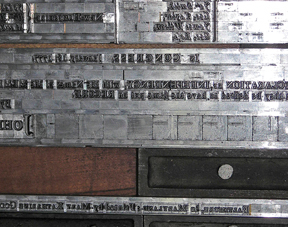 In addition, I have been corresponding with Theo Rehak at the Dale Guild Type Foundry, who has ATF Caslon 471. 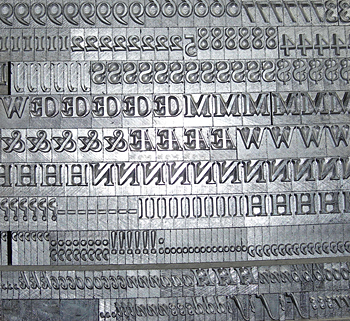 Theo spoke very highly of Ed Rayher, of Swamp Press, who has the monotype #337 of Caslon. I have been corresponding on and off with Ed since February and will touch base again next week. July 4, 2009 – I am thinking to produce two separate editions – one “historically correct” and the other a “contemporary gender-inclusive” version…blaspheme!!!! Happy July 4! 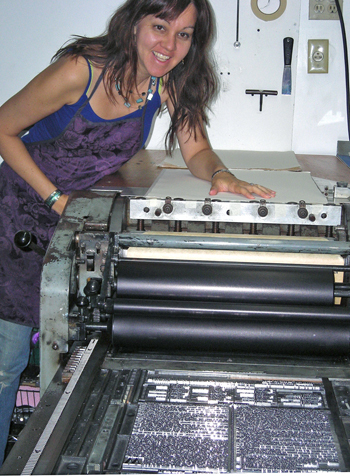 July 22, 2009 – Conversations with Katie MacGregor, papermaker, regarding paper color and weight. Katie is making a batch of paper with cotton and muslin for another job. She will add her “special reserve” abaca for me so that the off-white color will not be too pink or too yellow. I decided to lighten the color we see now, which is yellowed with age, to what the paper might have looked like in 1777. Katie will adjust her laid-line screen for the 21×16 sheet size and understands the color and weight requirements, as all her papers are conservation quality and she has extensive knowledge about historic papers. We are hoping the rains subside next week in Maine, when the paper will be pulled and set for drying, so that the deckled edges lay flat. 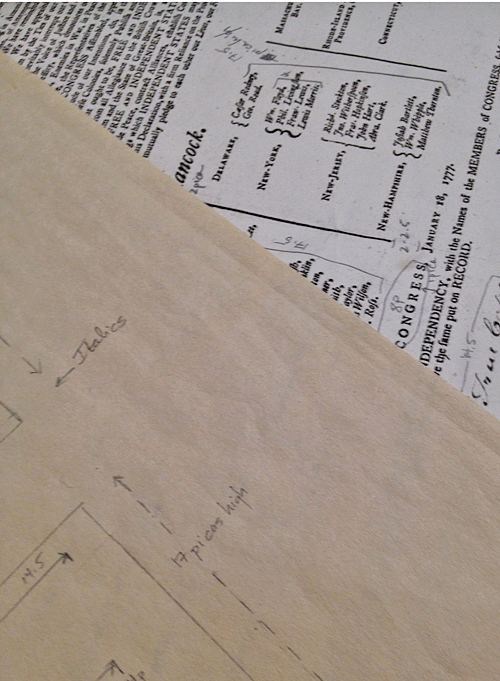 July 23, 2009 – I pulled a proof on a sample of paper Katie had sent me of her “Cobscook.” The final paper will be more like her “Stillwater.” The paper took letterpress beautifully, both dry and dampened. I am not planning on dampening the paper. July 28, 2009 – I spoke with Katie and she will be mixing the muslin & cotton with a small additive of abaca pigment today or tomorrow. I decided upon a weight that is thicker than the original so the sheet will hold up well to handling and make a nicer impression. The rains and flooding have been brutal in Maine. We’re hoping it calms down next week to aid in the paper drying process! 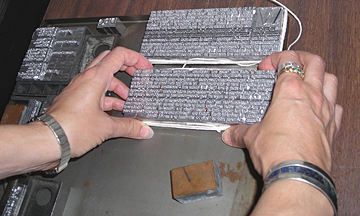 August 7 , 2009 – Type casting of Caslon has begun by Ed (Swamp Press). Roman 11pt on a 12pt body for the main text + italics for the signors names. Ed has ordered mats from England for the quaints and flower sorts. 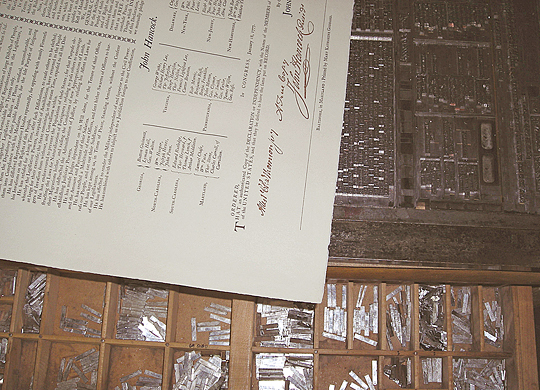 August 12 , 2009 – I built a new type cabinet to store the Caslon that will be coming in. My 2/3 type cases arrived today, along with the first batch of type, so distribution begins this weekend. August 13 , 2009 – The last class of Summer Session is over and the Studio is now closed to the public. Another heavy package of Caslon has arrived with more to come tomorrow and next week. Let the games begin!!! 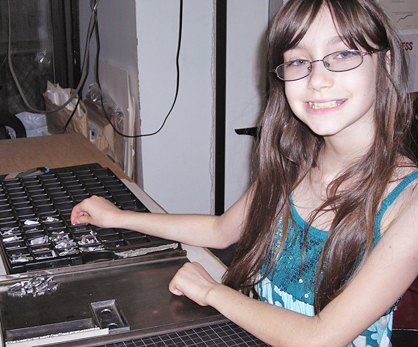 August 16, 2009 – My sister and niece arrived today to help with the beginning of distributing the Caslon 11pt on a 12pt body. It looks tiny! Robyn handled the small caps, while Terri & I began the lower & upper case Roman and numerals. There is so much type, it feels we barely made a dent! all work & no play . . .
August 20, 2009 – More volunteers arrived this week to help with distributing type: Chad, Maria, Nicole and Elliot each took a shift of a few hours, while Lee worked on the press (Houston, we have a problem…) Thanks all! 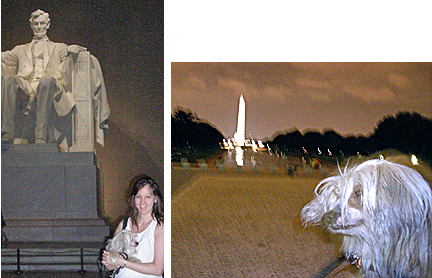 August 27, 2009 – We leave for a long weekend to Washington D.C. and will visit the Goddard Broadside again, which is now on exhibit and of course say “Hey” to Jefferson. 72pt. 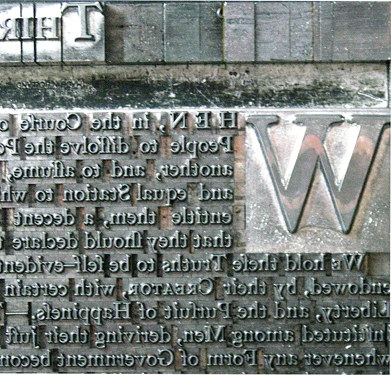 “W” + quaints, sorts, & additional spacing material. September 2, 2009 – I began type setting the document! I’m sure there was repetitive stress hand injuries in the 18th-century print shop, especially when setting newspapers! The spacing between words is taking additional time. 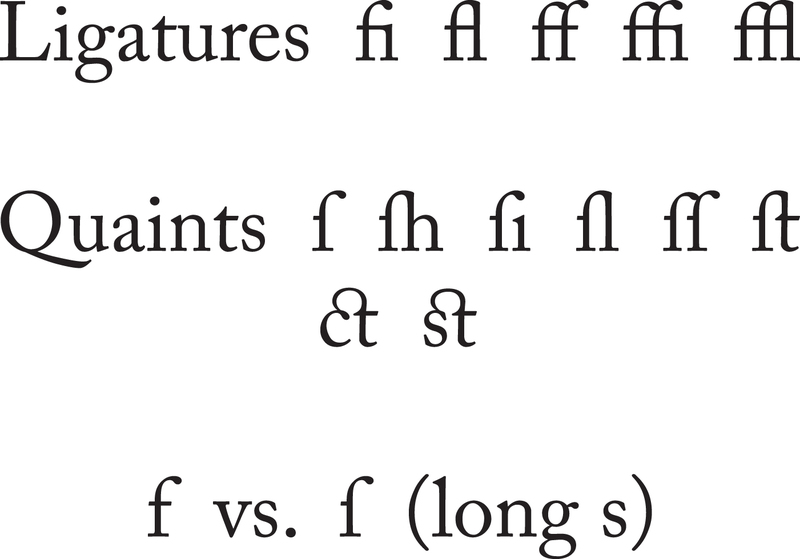 I have to remember to put in the long-s (“f”) and quaints “ct” and “st” ligatures “ff” + “fi” + “ffi” + “fl” + “ffl” etc. I worked for 4 and a half hours with too many interruptions in the day! September 3, 2009 – the left hand side of the 2-column text is now set. There is one ligature that was missing from the casting (“ft” the long s + t as in “moft” and “hiftory”). It is being cast today and mailed out. It will take quite a bit of time to swipe out the type with the quaints, especially with lines that are unleaded. I managed to get 5 hours in, in between troubleshooting the press problems! September 5, 2009, Saturday – Ed called to say he cast the additional letters and will send them overnight for Sunday delivery. Ah, modern convenience. Mary K. would have had plenty of type in her shop. But, I suppose if she were in a bind, she would send a messenger to a print shop in Philie, since Caslon was the font of the day, although Ben Franklin would have also had Bodoni from Italy. The “ft” quaints arrived with the mail. I set more of the right hand column and then switched to the signors, mostly in italics. Thomas Jefferson’s name is abbreviated (“Thom.”) and the “m” is a superscript (6 point). The “ff” is a ligature (always fun to use). I finally got in a 9-5:30 day, but took a doggie break in the middle (7 hrs)! September 6, 2009, Saturday – The package of extra caps was at the studio when I arrived at 10am. I worked for 6 hours today, replacing the “P’s” and “ft” ligatures and setting the last paragraph. I began to set up the press bed – first with the signors names and cutting additional leading, and then the right hand column. I finally pulled a proof at and did a quick scan for typos, and swiped out a few letters. 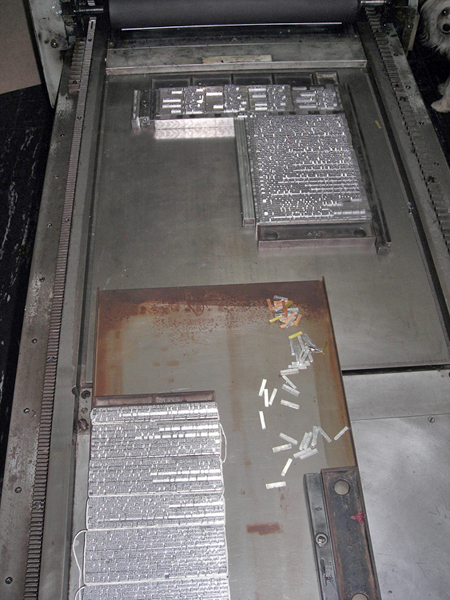 September 7, 2009, Monday – proofed, replaced typos, pulled out leading, proofed again (4 hrs). September 8, 2009, Tuesday – I set the bottom text. John Hancock’s name is listed twice. The last line is “Printed by Mary Katharine Goddard.” I wonder about Mary K. compelled to list her name so boldly when the men from the Continental Congress were hiding out in Baltimore concerned for their lives, and she voluntarily put herself at risk for treason. A true Daughter of Liberty and advocate for Freedom of the Press! September 30, 2009, Wednesday – Printing: After a much needed vacation (and press tune up) + more proofing, it is time to Go To Press ! . . .
October 1, 2009, The paper took letterpress printing beautifully! October 6, 2009, Tuesday – Printed John Hancock’s signature from a plate. + Essays Page November 18, 2009 – Just a quick update: I had received the essays from David Armitage (Harvard History Professor and author of The Declaration of Independence: A Global History) and Martha King (Historian of early Americana and author of an upcoming book, Making an Impression: Women Printers in the Southern Colonies in the Revolutionary Era). My own essay is still being edited and will soon be ready for digital typesetting. The Studio is right on schedule. 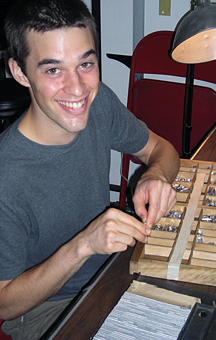 November 28 , 2009, Saturday – David Armitage visited the Studio today. We had a nice time chatting about Mary K. Goddard, Jefferson, letterpress printing, and the William Blake exhibition on view now at the Morgan Library. December 4 , 2009, Friday – The plate of all the essays arrived. The portfolios are made of Coventry paper. I picked up Bugra white paper for the essays, ripped, trimmed and ready to press this weekend. 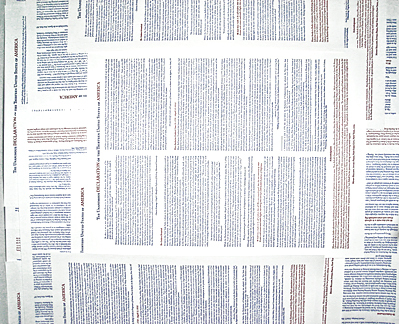 December 5 & 6, 2009, Saturday & Sunday – Printed essays in blue and red + cover labels, 20 x 16 inches. Portfolios to be assembled this week!